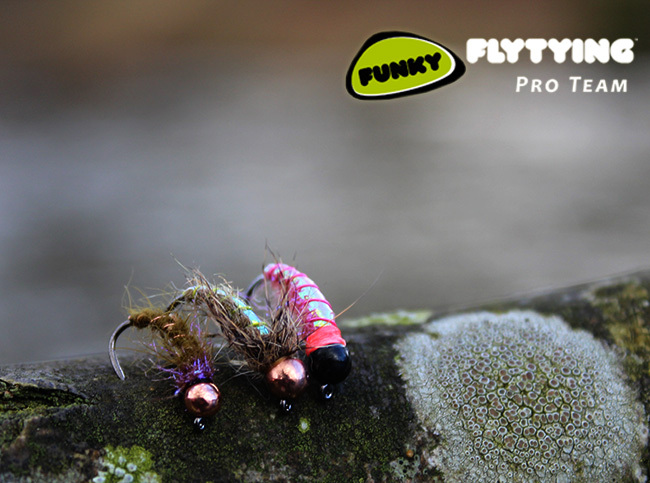 Now the extremely cold snaps have arrived, you’re not doing yourself any favours fishing just one or two flies if you’re fishing for grayling – Obviously depending on the river you’re fishing this will vary, but it’s a great little tip to try if you’re not catching anything…. This cold weather means that grayling will hit the deck hard, and stay there for a considerable amount of time. The temperature here in south Wales is hitting lows of -6 throughout the nights, and hardly rising until 9 or 10am – You need as much weight as possible to get to where the fish are laying, so a three fly cast seems to work best – for me anyway. Above are my three favourite flies to fish czech nymph style, the Pinky usually goes in the middle, with the flash back hares ear top dropper and the Olive and UV bug on the point. Each have their own purpose on the cast, but overall, it’s the accumulation of weight which seems to be key in the winter grayling setup. The Pinky is basically a shrimp pattern, tied with UV lavender dubbing, ribbed with pink wire and featuring a hot spot collar. The 4mm black tungsten bead and two layers of lead allow the fly to sink quickly, dragging whatever else on the cast with it. An all time favourite trout and grayling bug of mine – represents much of the food in the river, such as hydropsyche and caddis. The lighter fly on the point tends to ‘wave’ around in the current, on some days, the fish can’t resist it. The Brown UV thorax seems to work wonders on it’s day too.